Cedric Nicolas-Troyan, the director, makes a wonderful transition from the prequel of Snow White to the sequel without dwelling on the first story much. The Huntsman: Winter's War began with controversy before filming even started. A change in stars, a change in directors, and no one knew what the movie would end up like considering one of the main characters, Snow White, was no longer a real part of the film. Wondering how the story line would reconcile itself starting out before the Snow White story line made the film even more intriguing than the drama surrounding the film. The Blu-ray's cover clearly states "The Story Before Snow White", so the question remains - how old is the Huntsman, really? The story begins with the surprisingly loving relationship between Raveena (Charlize Theron) and her sister, Freya (Emily Blunt). While Raveena is still our evil Queen, her sister, Freya, has not yet come into her powers. You see a glimmer of goodness and love in Raveena in this film that you leaves you wondering how Raveena became so evil. But, alas, despite the title of the movie and the amazing actress Theron is, this movie is really not about her. Freya misplaces her love, has a child, and the child is brutally ripped from her arms. Here we can see what can turn a good person into an Evil Queen. 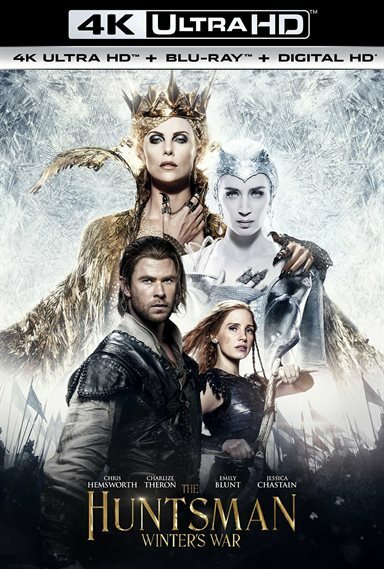 Leaving Raveena, Freya goes North to conquer her own kingdom, and we finally see the beginning of the story of the Huntsman (Chris Hemsworth) and his childhood love (Jessica Chastain) who becomes his wife. Starting out as children and quickly progressing to adults, we see them molded under Queen Freya, but her influence is not bone deep for both. They defy their Queen and there begins the story of The Huntsman that we are familiar with from the prior movie. Just remember, things are not always as they seem when dealing with the Evil Queen. Cedric Nicolas-Troyan, the director, makes a wonderful transition from the prequel of Snow White to the sequel without dwelling on the first story much. It's a quick and easy story line and works for anyone who has seen the prior movie, but gives just enough background needed for someone who hasn't. I was skeptical that the movie would be able to bridge the gap, and it was quite surprising that the main story actually takes place after Snow White has killed Raveena (or so we thought) but Nicolas-Troyan and his writers, Craig Mazina and Evan Spiliotopoulos, do more than an excellent job with the timeline. The one disappointment in this movie is that The Huntsman's kiss was the one true kiss that woke Snow White up from her curse in the first movie, so what is she doing married to her childhood beau? Yet, the disappointment last only a brief moment, so engaged are we in Hemsworth's acting and mannerisms. In addition, by starting out with The Huntsman as a child, and progressing to what seems like just past the ending of Snow White, clearly, not much time has passed and The Huntsman remains young and heroic in our minds - and on the screen. The real story begins about 20 minutes in, when Raveena's mirror is discovered missing and the King commands (through Snow White) that the Huntsman find it. The journey he takes is reminiscent of what Snow White went through after escaping Raveena, but there are both new and old friends on the road and more of a clear romance than in the first movie. It's not all romance though; this storyline exists for the ultimate betrayal - or so we think. It's hard not to compare the two films since the story lines are so intertwined, but both of them stand alone, with The Huntsman providing a lot of answers to the questions that went unanswered in its predecessor movie. Is this an adventure story, epic tale of war, love story, dark fantasy, or a fairy tale? It reminds me of Once Upon A Time, with all those elements thrown into the movie. Surprisingly, having all these elements does not mar the movie. It, in fact, enhances the story and pulls you in - rooting for the lovers to reunite and win the war, all at the same time. Freya gains possession of Raveena's mirror half way through the movie and we hear the words we all grew up on - "Mirror, Mirror on the wall. Who is the fairest one of all?" Surprise, surprise! I just can't spoil it for you. Buy the Blu-Ray and watch the movie! The 4K UHD gives you the option of watching the theatrical version (movie theater release) or the extended edition with deleted scenes. Of course, watch the one with the deleted scenes. They flow effortlessly with the movie version and one wonders why they were cut to begin with. The film is beautiful to watch.You can see the ice slivers, the reflections in the Magic Mirror, and the instant changes in minutia in Raveena's face at the end, all in the 2160p beautiful UHD color palette that is a bit muted at times, but intentionally so, to follow the tone of the film itself. The DTS:X sound quality is amazing. The crescendos can be heard during battle, as can the whizzing of the arrows flown overhead. The sounds of the ice wall flying up, as well as the spikes growing out of Raveena, enhance the viewers experience. Of course, the actual music score is so effortless and true to the movie that the overall listening experience is smooth and flowing. As with other 4K UHD releases, the Special Features are relegated to the Blu-ray disc, which offers behind the scenes, deleted scenes, behind the scenes with the cast and Director's commentary, as an additional benefit. Turns out, Hemsworth's character isn't the only hero here. The story line flows, the plot twists provide that "wow" moment, even though you may see some of them coming, and the actors are an all star cast. But, he clearly makes the movie worth watching! Download The Huntsman: Winter's War from the iTunes Store in Digial HD. For more information about The Huntsman: Winter's War visit the FlickDirect Movie Database.